I’m a sucker for a framed print. Just ask my husband. I got Anthony Burrill’s work hard and be nice to people poster for my 30th because, when it comes to life mottos, he took the words right out of my mouth. I chose tomorrow is a lovely day for the nursery to remind me that newborn babies do eventually learn to sleep, and night feeds don’t actually last forever (though it might feel like it). And I hung Jane Foster’s London bus in my little boy’s room in the hope that, growing up, he might be as inspired by the city as I was. 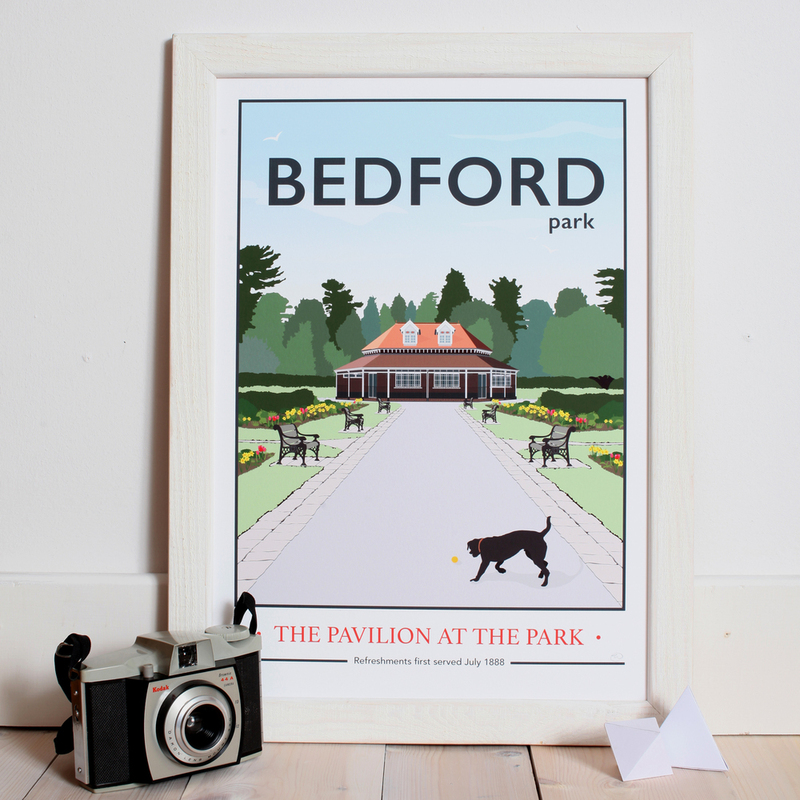 So when I saw designer Tabitha Mary’s prints of Bedford’s Pavilion in The Park and Kiosk in The Park, it was love at first sight. The Pavilion café is right next to my first house. 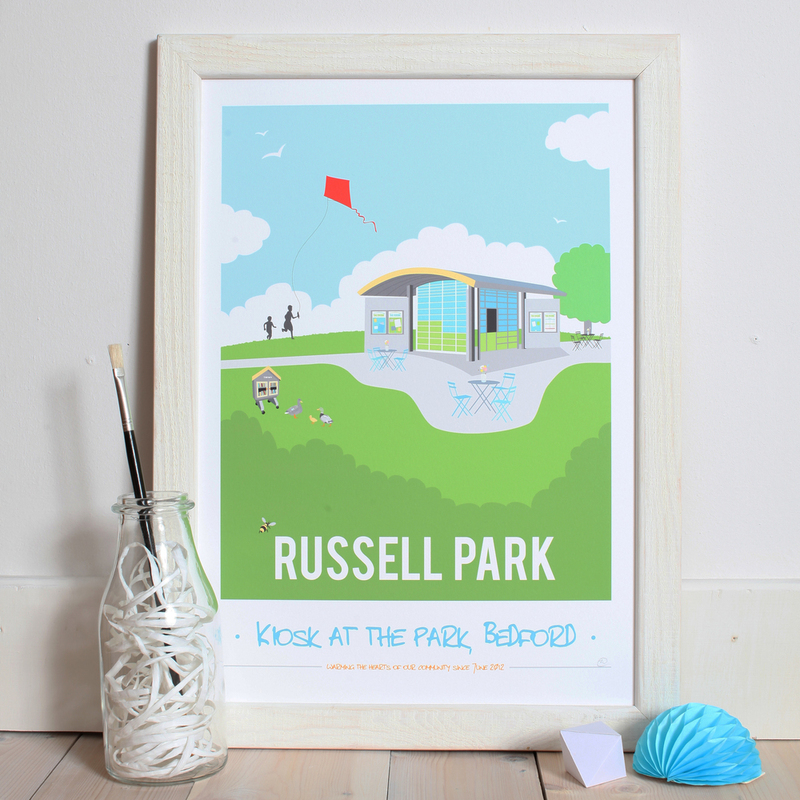 And Russell Park – which is home to The Kiosk café and also happens to be at the end of my street – has been something of a lifeline during 2 stints on maternity leave. 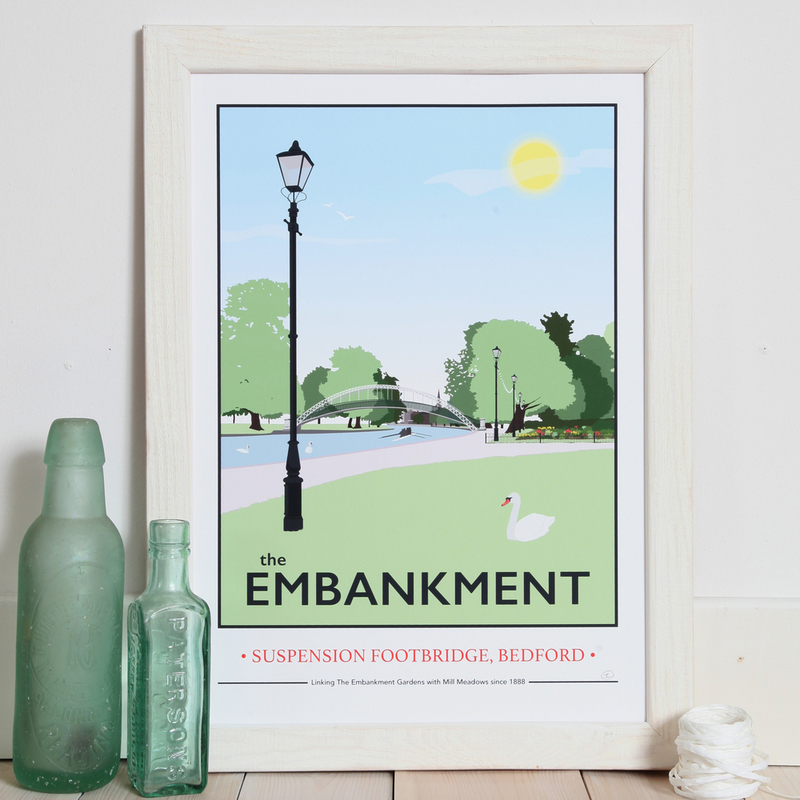 If only, I thought, there was a print of Bedford embankment, where my husband proposed and we had our wedding photos taken 10 years back. I’d been looking for a photograph or print of the old suspension bridge for years, but nothing I found ever quite hit the mark. I looked into the idea of commissioning Tabitha to design something, but couldn’t cover the costs (unsurprisingly, statutory maternity pay doesn’t cover bespoke artwork). And that’s when I turned to Facebook. I’m a member of some brilliant community groups – Castle Residents’ Association and We Are Bedford to name a couple – that act as both a calendar of local events and a platform for networking. So I posted on each page that night explaining that, if a few of us clubbed together, Tabitha would be happy to design something just for us. While I knew there’d be plenty of interest, I wasn’t sure how many people would be willing to stump up their cold hard cash for a print that didn’t actually exist yet. So it’s fair to say Tabitha and I were equally surprised by what happened next. Within a couple of hours I had emailed Tabitha a list of 20 people who wanted in on the action, so she agreed to go ahead. That was Tuesday. By Wednesday night the print was available to buy on her website and she’d already sold 50. And by Friday – 3 days after that first tentative Facebook post – locals were posting pictures on the thread showing Tabitha’s prints decorating the walls of their homes. I’ve seen the phrase ‘the power of social media’ bandied about all over the place, but this time it was more than just a cliché. And it wasn’t the only thing that stopped me in my tracks that week. While I was drumming up local interest for the print, a friend was busy with the rather more worthy task of raising thousands of pounds for a local family who had their house ravaged by fire. Via Facebook and GoFundMe. Fast-forward a few more weeks and Tabitha has been commissioned to create a similar design for the July issue of arts and culture paper The Bedford Clanger (they’ve covered the story here). You can buy that one on her website, too, and I’ve no doubt the good people of Bedford aren’t finished with her yet. 1) If you don’t ask, you don’t get. 2) There’s power in people. 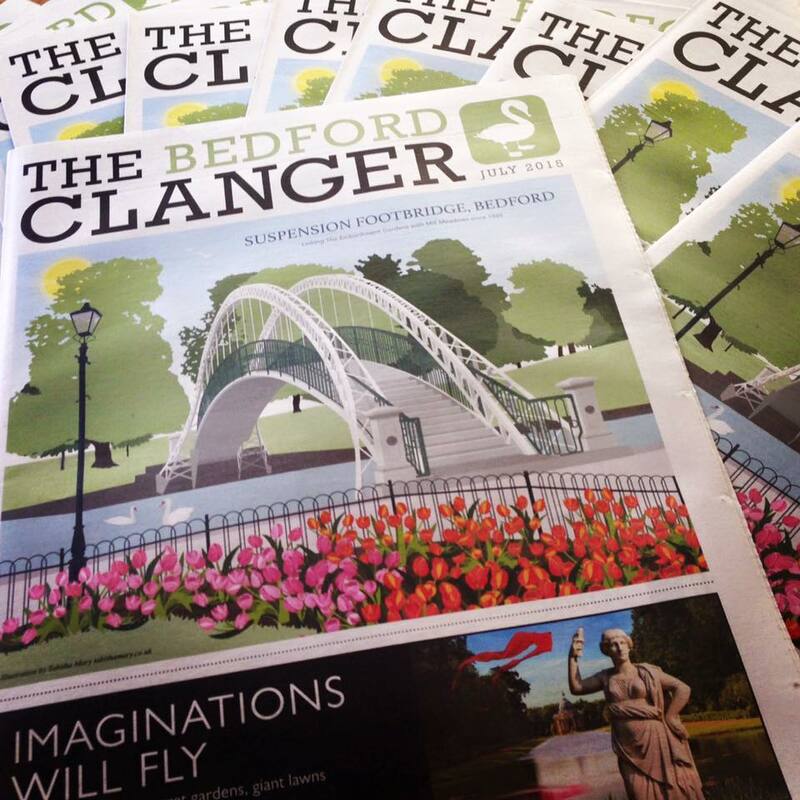 And 3) Bedford is a pretty great place to live. I love this post Katie, and love the piece you funded. I added it to my collection of Bedford art from Tabitha, also made for me on special request. I reblogged your post and added my story on my blog. It just shows, we all need to ask for what we want, more often!